A spectacular bargain! 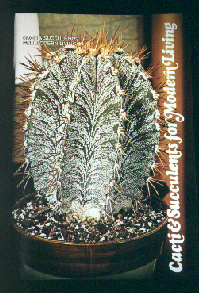 This 80 page full-color book has over 130 photos covering a wide spectrum of cactus and succulents. It has advice on indoor growing, light needed, watering, temperatures required, fertilizer, soils, containers and repotting, propagation, flowering and trouble shooting problems. In short, all you need to get started. The best book we have ever seen under $20. First published in 1976 and still the best on the market. Reprinted and distributed by Dan Bach of Tucson.